February being the month of love, I thought I’d start a ‘Wonderloving’ series, sharing some of my favourite products. First up…. Ohemgee ohemgee you HAVE to smell the SW Basics body scrub. Toasted, caramelised coconutty deliciousness *wipes drool from keyboard* I truly wish smellovision existed. How I have managed not to shovel this scrub into my mouth is a testament to my strength of character. If cannibalism ever becomes a thing, this is the stuff you’ll want to sprinkle on me first. S.W. Basics is a natural skincare range with a “no frills” philosophy, that has gone from being a Brooklyn small batch co to being stocked in Target. Every single product is made from five ingredients or less, all natural, organic and/or fair-trade. The ingredients look like they’ve come straight off a grocery shopping list and the jars look more at home on my kitchen shelves than the bathroom. As somebody with sensitive skin and allergies, I like skincare with short ingredients lists which generally means less chance of a reaction. 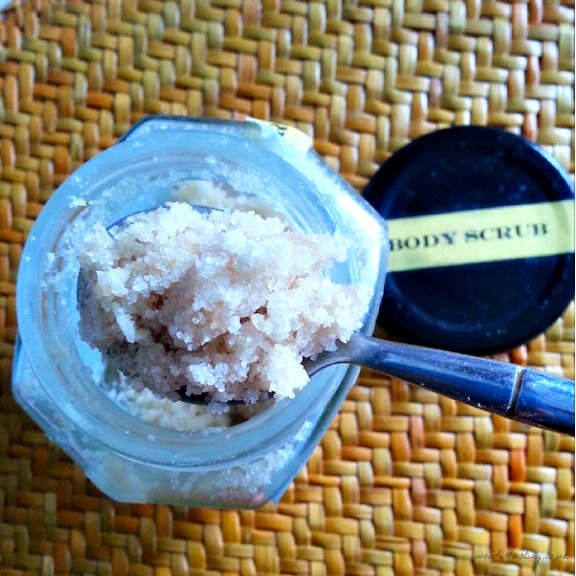 The body scrub is made from just three ingredients – coconut oil, Demerara sugar and coconut. You could probably whip this up yourself but they’ve kindly saved me the trouble. Additionally it’s best to use body scrubs that don’t contain man-made microbeads which are causing havoc on the environment and our food chain. So I love the ingredients, philosophy and oh my god the smell. How about the performance of the body scrub itself? It’s fab – suitably scrubby but doesn’t scratch and skin is left feeling soft and moisturised. I find it performs best when used on damp skin and it rinses away without leaving an oil slick. I’ve used it without using moisturiser after showering in the evening and my verging on crocodile winter skin stays moisturised. If I was heading out in the morning I would need to slather on an oil. No outrageous claims or ‘magic’ ingredients yet it works a treat. S.W. Basics shows that less can be more. 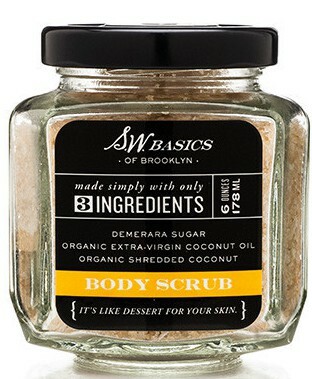 SW Basics Body Scrub Ingredients: Demerara Sugar, Extra-Virgin Coconut Oil*, Shredded Coconut*. *Organic. I am a convert to natural scrubs after hearing horror stories about plastic beads in exfoliants + Victorian British plumbing. This one sounds luuurvely!